Seattle Aquarium exhibits and restrooms are wheelchair accessible. If you need a wheelchair you can check one out, free of charge, from the Guest Services desk (available on a first come, first serve basis). A credit card is required for check-out and will be charged $600 if the wheelchair is not returned. Service dogs are welcome in all Seattle Aquarium public exhibit spaces. When registering for a class, please use the registration form to let us know how we can best assist your group and/or request any special accommodations needed. We try to accommodate all groups with advance notice. If you would like more information please contact our registrar at (206) 693-6196. Any information you can share will help us prepare so that your students have the best experience possible. Persons with disabilities receive a $2.00 discount off the regular price of admission at the Seattle Aquarium. Aides required and accompanied by persons with disabilities enter free of charge. The Seattle Aquarium aims to be inclusive and welcoming to all, and believes that our audience should reflect the diversity of our region. Toward that end, the Seattle Aquarium Connections program provides complimentary admission tickets through community partner organizations. Learn more here. FLASH Card holders may enter the Seattle Aquarium free of charge with one aide. Gold Card holders may also enter the aquarium free of charge. For more information about the City of Seattle’s Flash and Gold Card program click here. The Seattle Aquarium social story visual guide will help families and groups prepare for their visit to the Aquarium. May be especially useful for visitors with autism, sensory sensitivities, or younger audiences. Look through it before your visit, or print it out to bring with you. View or download the social story here. Interpreters and sighted tour guides for deaf, blind and visually impaired groups. If you speak another language and your group consists of six or more people, we may be able to provide an interpreter for your visit to the Seattle Aquarium. 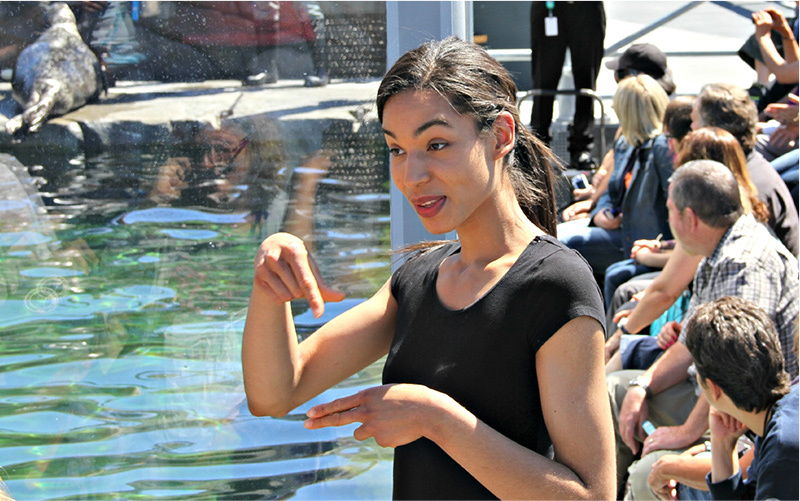 With a minimum of two weeks’ notice the Seattle Aquarium will arrange for an ASL sign language interpreter or a sighted tour guide at no additional charge for our deaf, blind or visually impaired visitors. Please call (206) 693-6196 or e-mail at connections@seattleaquarium.org with a minimum of two weeks’ notice to request an interpreter and make arrangements. Requests will be filled on an as-available basis. 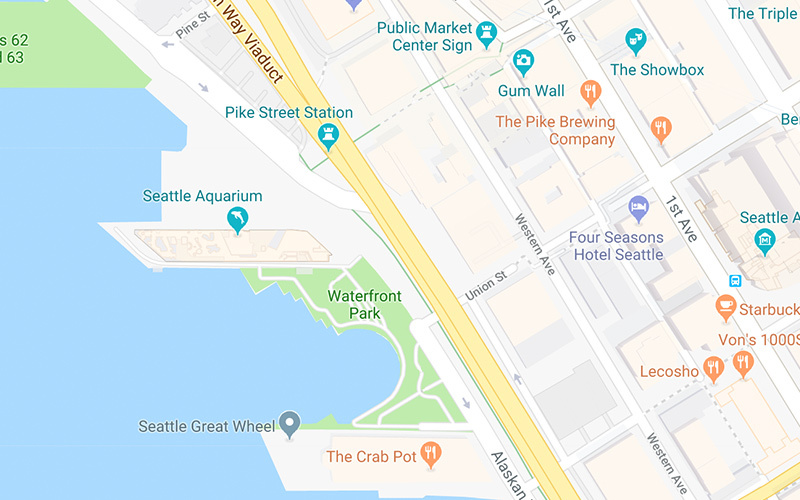 The closest handicapped parking spaces to the Seattle Aquarium entrance are located at the DPS private parking lot across the street from the Aquarium. The Pike Place Market Public Parking Garage also has handicapped parking and elevator access to the Pike Place Market. Both locations charge $3.00 per hour - rates change seasonally. See map here. There is no public handicapped parking near the Seattle Aquarium although some spaces are wheelchair-friendly and with a valid handicapped permit (or license plate emblem) you can park free of charge in any public parking space. More information on public handicapped parking is available at the SDOT web page. A passenger drop-off/pick-up zone is available in front of the main entrance to the Seattle Aquarium. Find more parking information here.